Advertising Space is available on the KL Bar Homepage for placement of advertisements. 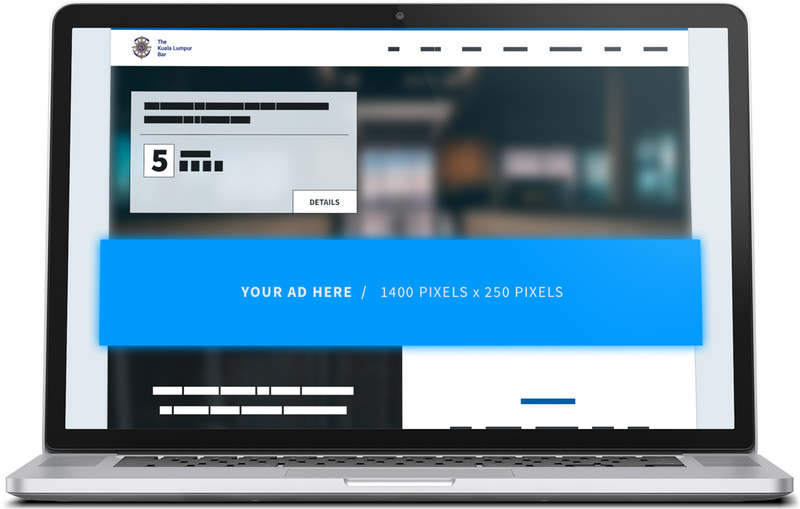 There are 3 high profile Ad blocks located at the top of the page directly below the event slider, these are 360 x 100 (pixels). At the bottom of the page, just above the footer we provide 2 ad blocks 555 x 160 (pixels). See Ad blocks available below. All the terms and conditions in the KL Bar Website shall apply to this Agreement. It is the responsibility of the advertiser to design the banner which the advertiser wishes to advertise on the KL Bar Website at its own cost and expense provided always the Kuala Lumpur Bar Committee (“KLBC”) reserves its right not to accept any banner at its sole discretion. The top banners shall be 360 x 100 pixels and not exceeding 50 kb (“Banner Size”) for the larger bottom banners the size is 555 x 160 pixels and not exceeding 100 kb (“Banner Size”) for the big banner. Banners should be provided in JPG or GIF format only. Flash banners are not permissible. The position of the advertisement shall be at the KLBC’s sole discretion and may from time to time be varied by the KLBC at its discretion without notifying the advertiser. infringe any other applicable laws, regulations, governmental rules and industry codes, including but not limited to any laws relating to defamation or sedition or any criminal laws. The advertiser shall indemnify and hold the KLBC harmless from and against any and all claims, demands, causes of action, liabilities, losses, judgments, fees, costs and expenses whatsoever arising in connection to the advertisement or any part thereof. The KLBC is entitled to enter into similar arrangements with other third parties. While all efforts will be taken to ensure that the KL Bar Website runs 24 hours a day, no compensation will be given to any advertiser due to any interruption or downtime of the KL Bar’s server(s) and/or KL Bar Website, and the KLBC makes no representation or warranty, whether expressly or by implication and neither is the KLBC responsible nor liable for any loss, damage or expense suffered or incurred by any advertiser arising out of the advertisements placed on the KL Bar Website. Payment shall be made upon submission of Order Application. The payment is not subject to any refund or set-off in the event of any earlier termination of the Order or reduction of the duration of the placement of the advertisement for any reason whatsoever. The advertisements will only be placed upon receipt of full payment of the advertisement charges in advance. The advertisement banner and contents will have to be submitted to the KLBC for approval within 7 days from the date of submission of the Order Application. The KLBC, upon giving its approval in writing, will endeavour to upload the advertisement within 3 working days from the date of the approval.